Once a month, on selected Fridays, the Children’s Museum of the Treasure Coast welcomes kids ages 4-12 years old to enjoy a night at the museum while parents go out on the town. 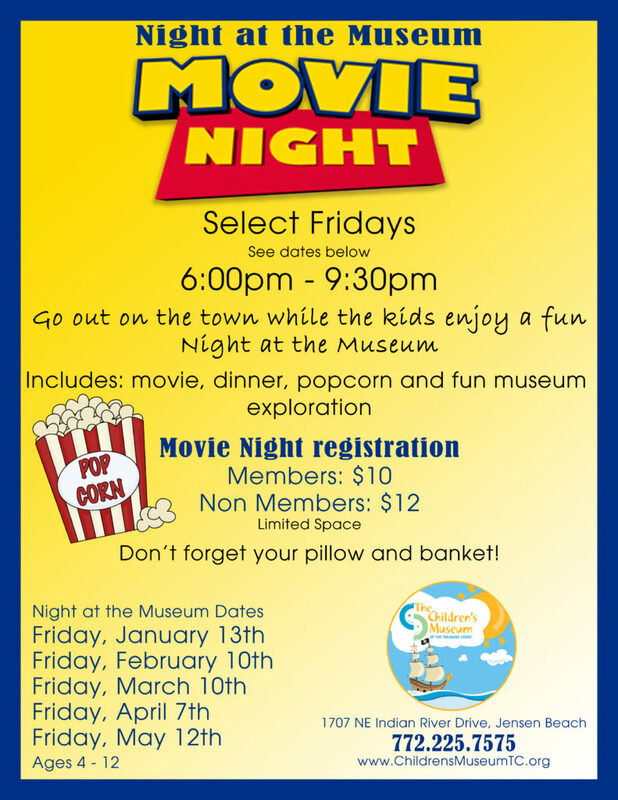 “Movie Night” is an awesome way for kids to explore the museum and meet new friends. In addition to fun museum exploration, the evening includes; a movie, dinner and yummy buttery popcorn. Kids are able to wear their comfy pajamas and bring a pillow and cozy blanket. There’s limited space at these events so families must call 772-225-7575 in advance to register their child. Upcoming dates available are; April 7th, May 12th, June 9th, June 23rd, July 7th, July 21st, August 4th, and August 18th. The cost is only $10 for Members and $12 for Non Members. Don’t forget your pillow and blanket!